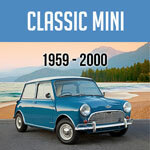 This article is intended as a 'guide' to keep your Mini properly maintained. Proper maintenance will minimize the chance of 'car problems' down the road, and greatly reduce the chance of expensive repairs resulting from a neglected Mini. Document your service records as this will make your Mini more attractive to the potential next owner. Understand Rxx and Fxx model designations. Always refer to YOUR Mini Owners Manual for factory recommendations for YOUR Mini. Maintenance intervals on motor vehicles were conventionally based solely on a fixed time period or a specified amount of accumulated driving mileage. However, operational and driving conditions have a major influence on your vehicle’s routine maintenance requirements; the distance traveled is only one of these significant factors. A vehicle used for short trips in the city with numerous cold starts, prolonged periods of idling, stop and go driving, and high engine speeds during acceleration may require more frequent maintenance intervals than a vehicle that is driven long distances at moderate engine speeds. Your MINI vehicle uses sensors and algorithms together with the elapsed time and the driving distance/profile to monitor and evaluate your vehicle’s maintenance service needs. This information is then used to adapt dynamically the parameters used to forecast the applicable maintenance service task intervals. 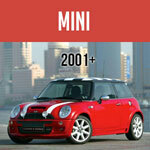 All MINI vehicles are equipped with an integrated MINI Maintenance System. This maintenance “reminder” system helps ensure that the vehicle inspections and maintenance service tasks are performed at the forecasted intervals that apply to your vehicle. For each specific maintenance service task, either the future date (month/year), remaining miles or both are provided as noted above. The system monitors variable inputs to forecast the intervals and alert the driver when one or more specific maintenance tasks should be performed. Although these items do not appear in the MINI Maintenance System’s display in the vehicle, these services should be performed when your vehicle’s engine oil is changed in accordance with the interval identified by your vehicle’s MINI Maintenance System. Mini's onboard computer will prompt you with some of the maintenance needs using the Condition Based Service (CBS). Sensors and special algorithms take into account the driving conditions of your Mini. Based on this, the Condition Based Service recognizes the maintenance requirements. The system makes it possible to adapt the amount of maintenance corresponding to your user profile. The Mini's remote control key fob records all of your Minis service data. Information on the required maintenance is continuously stored in the remote control. The dealer's service center can read this data out and suggest an optimized maintenance scope for your Mini. Disconnecting the battery for extended periods will disrupt this record. • BMW Longlife-14 FE+ 0W-20 Full Synthetic for 3rd generation Model Year 2016 and later. Engine oil should be changed when the vehicle’s engine is at operating temperature. If an engine oil service is being performed or you need to add engine oil between changes, please refer to the Owner’s Manual for the recommended engine oil for your MINI vehicle. Please refer to the Owner’s Manual for additional information. • Performing a specified occurrence of a maintenance service task. Such intervals are primarily determined by the MINI Maintenance System unless otherwise noted in this booklet. The information contained in this booklet is correct as of the “print date.” MINI reserves the right to make changes to the vehicle’s maintenance service parameters and intervals due to running vehicle production improvements (among other things). Your authorized MINI dealer can utilize the most current applicable maintenance service information to determine which maintenance service inspections and service tasks need to be performed on your vehicle. • Verify Check Control messages. • Check indicator and warning lights. • Check sunroof guide rails for excessive contamination. • Inspect tires, adjust tire pressures and reset Tire Pressure Monitor. • Check parking brake functionality while the vehicle is being driven into the workshop. • Change the Engine Oil and oil filter (as shown in CBS). For the recommended engine oil for your MINI vehicle, please refer to the Owner’s Manual. *These additional connected services will not be shown in the vehicle’s CBS display. • At every 2nd Engine Oil Service: VentilationCabin Microfilter: Replace. • At every 4th Engine Oil Service: Intake air filter: Replace (reduce replacement interval in dusty operating conditions). • At every 6th Engine Oil Service: Spark plugs: Replace (approximately 60,000 miles). • Check operation of horn, headlight flasher and hazard warning flashers. • Check instrument and control lighting, and heater/air conditioning blower. • Check lighting system: turn signals, back up, license plate, interior (incl. map, reading lights), glovebox, luggage area lights. • Safety belts: Check condition and function. • Check windshield wiper and washer jet positions. • Tires, incl. spare in MINI Cooper: Check tread depth, wear pattern, outer condition, inflation pressure. If necessary, correct pressure. • Battery: Check state of charge (magic eye) and charge if required. • Visually inspect all SRS airbag units for torn covers, obvious damage or attachment of stickers. • Convertible: Open the convertible top. Activate automatic rollover protection system manually. • Coolant: Check fluid level and concentration. • Windshield washer and intensive cleaning systems: Check protection level, fluid level; top off if necessary. • Brake system connections and lines: Check for leaks, damage and correct positioning. • Underbody, incl. all visible parts (i.e., transmission, rear axle, fuel lines, exhaust system): Check for damage, leaks and corrosion. • Steering components: Check for clearance, damage and wear. • MINI Mobility System: Check expiration date on sealant bottle. Change sealant bottle if necessary. • Replace brake fluid (as shown in CBS). • Replace brake pads, clean brake pad contact points in calipers. • Brake discs: Check surface and thickness; replace as necessary. • Parking brake: Repair or replace parking brake shoes/linings only if a reduction in the brake’s effectiveness is noted. The maintenance schedule as shown is designed to maintain the proper function of the vehicle’s emission control systems. This will help ensure optimum performance and fuel economy. Absent a vehicle transfer, a 2017 vehicle purchased from an authorized MINI dealer in the United States (including Puerto Rico) is covered by the MINI Scheduled Maintenance program for 36 months or 36,000 miles, whichever occurs first. If a covered maintenance service task’s procedure specifies the inspection of components with a performable adjustment, when required and in conjunction with performing this maintenance service, these adjustments are also covered. For more information on your vehicle’s maintenance services requirements, procedures, intervals, please refer to the Maintenance Service Summary. Don't pollute. Conserve resources. Return used oil to collection centers.